I want to start with a long quote from this 13th century mystic. It can be read online here, but the physical book is a worthwhile purchase. I will quote this in full, because it's the struggle in my own faith journey to letting go and letting God. Someone imagines that he can rid himself of his negative qualities by means of his own labor and striving. When he struggles and makes every effort possible only to be disappointed, God says to him, "You thought it would come about through your own power and action and effort. That is the law I have established, that is, that whatever you have you should expend it in My Way -- only then does My grace arrive. "Now that you no longer have the means to continue, behold Our grace and favor and loving kindnesses, how they swarm down upon you. Even after a hundred thousand strivings you would not have seen so much as a tiny bit of this. So celebrate the praise of your Sustainer, and ask His forgiveness [110:3]. Seek forgiveness for your thoughts and conceit -- you thought that all this could come to you from your own striving. You didn't recognize that it all comes from Us. Now that you have seen that it comes from Us, seek forgiveness." For he is inclined to forgive [110:3]. Jesus' religious opponents did not like that he stayed in their prescribed "fence" of ritual purity. Instead them seeing the forest of God among the trees of their scriptures, they only saw trees. This issue continues to plague us. Their are verses and chapters and acclaimed religious heroes which and who contradict a life of mercy and grace but uphold self-discipline and rigidity. The priest Ezra comes to mind, to the neglect of the prophet Jonah, who was compelled by God to leave his cultic boundaries. Jonah is the anti-hero. He hates his mission to the ungodly Assyrians and refuses to learn from God's grace towards himself. Jesus' opponents believed if they tried hard enough to be moral and got enough people to try hard enough, God would deliver them from their Roman oppressors. Jesus, instead befriended and helped Roman oppressors, religious oppressors, Jewish traitors, disgusting lepers and loose women. His mission is to deliver us from the tribal oppression that divides us, and unite us instead. It's the minority position in religion, unity with our enemies. The default is judgment on our enemies. The mystics are the minority position prophets in the world. Their followings are small. St. Francis had brother sun and sister moon and he preached to the animals because we are all God's creation. He was not well received, but he is well remembered. 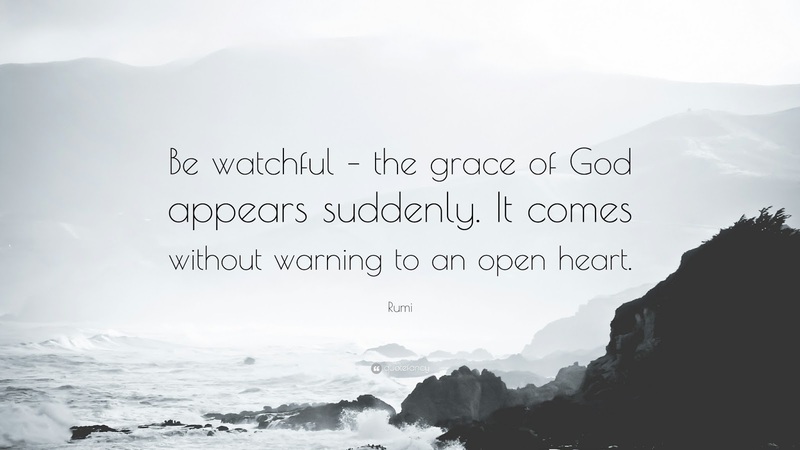 The mystic I quoted above is Rumi, an Iranian Muslim Sufi. The Sufis are the mystical branch of Islam. Like the Hebrew and Christian scriptures, there are unloving and judgmental verses from which division and tribalism emerge. But the mystics, like Rumi, focus on the uniting verses, believing these reveal the true nature of God, like a mother carrying a nursing child; such a beautiful metaphor, as gentle as the image of a "lamb, silent before its shearers", the image Isaiah uses for the God's suffering servant, whom the Christians recognize as Christ.